Among the FBI’s specialized capabilities, each office maintains an FBI Evidence Response Team responsible for collecting FBI evidence and processing complex crime scenes. The teams include personnel with specialized FBI evidence collection skills and forensics training in a variety of areas, including photography, crime scene diagramming and sketching, latent fingerprint recovery and processing, bullet trajectory determination, DNA recovery, fiber and trace evidence collection and post-blast recovery. Aside from being used in federal investigations, the FBI evidence teams are also frequently called upon by state and local law enforcement authorities, sometimes overwhelmed with complicated crime scenes and/or do “not” have the resources to conduct a proper search, needing trained technicians and/or special equipment. Working with their international partners, these teams are also frequently dispatched overseas because of a terrorism incident or some other horrific crime scene, again, mandating the need for special equipment and/or FBI expertise. 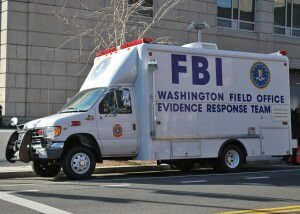 As reflected in the aforementioned photograph, in Washington D.C. the FBI has a special van that is dispatched to crime scenes when necessary. Directory members can be extremely helpful to anyone seeking information and/or a professional opinion concerning FBI evidence collection. Looking for an expert, visitors need only use the website’s search feature, entering the appropriate skill, issue, or need, as well as the geographical area of preference to make contact with an FBI specialist. Retired FBI Agents and Analysts with a background in FBI evidence collection, interested in securing a Directory listing and/or a personal email address, need only submit an online application to join the website. 1 Information contained herein was taken from publication captioned, “TODAY’s FBI: FACTS & FIGURES 2013 – 2014,” issued by the U.S. Department of Justice, FBI, Office of Public Affairs, 935 Pennsylvania Avenue NW, Washington, D.C. 20535, page 46.